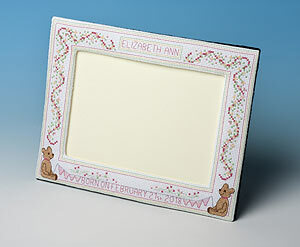 Last year Meg designed some cute cross stitch photo-frames for new baby boys and girls. But customers have told us that by the time they find out whether the baby is a boy or girl, there isn't usually enough time to stitch these frames. The interesting thing is that the finished designs aren't just for new babies. The designs don't include the word "new", they just has space for the baby's name - so these projects would also be brilliant for 1st or 2nd birthday pictures. So we have decided to rename the kits without the word new. But in the meantime we are selling the existing stock with the old packaging at a very special price. Matching our New Baby Girl greetings card, this kit includes charted alphabets and numbers to help you devise your own names and birth dates. The frame stands 19 cms high and 24 cms wide and the kit contains 14-count aida, stranded cotton, pre-cut plastic canvas, wadding, felt, needle, chart, full instructions and a piece of cream mounting card for the picture of your new baby girl. The kit would make a delightful and special present for new parents.